My rates are pretty affordable. If you purchase ad space this includes social media mentions, such as Twitter and Facebook. For advertising options or ad sizes please contact me and let me know what you're looking for. I'm pretty easy to work with so let me know what interests you and I'm sure we can come up with something great! This blog is PR friendly and I do participate in product reviews, sponsored posts and giveaways. Please send me an actual product for me to review. My mailing address is listed above. The product will not be returned. Also, I will not pay you for any portion of the review, including shipping charges to mail your product to me. Shipping must be paid by you. Also, giveaway products must be directly shipped to the winner by you. I repeat…please don't send me the giveaway product and ask me to ship it to the winner. I have four kids and trips to the post office are pretty much worse than going to the dentist to get teeth pulled. Need someone to represent your company at a major blog conference? Funds donated by sponsorship will be used towards my traveling and lodging expenses, as well as the conference pass. 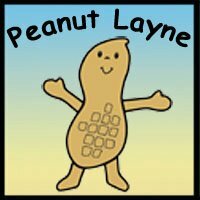 I will be offering many different packages for sponsorship so please contact me at peanutlayne5@gmail.com for more details if you are interested in having me represent your company!